"I look at gaming as a first-class citizen inside this company," the new head of Xbox, Phil Spencer, just told me on the phone on this the day it was announced that he's taking over all things Xbox at Microsoft. "And that's how [Microsoft CEO] Satya [Nadella] has shared it with me." Ten months since the Xbox One was revealed at an event that focused a lot on the platform's non-gaming aspects—TV, sports, TV, sports, you might remember—Microsoft's got a gaming guy in charge of the platform. Spencer has been the head of Microsoft's internal game studios and is a long-time gamer. And now, as announced by Microsoft today, he's in charge of a newly reorganized team that will see Microsoft's game studios, Xbox platform teams, Microsoft's music and video teams—all reporting to him, the long-time gaming guy. "When you make a decision to bring the head of studios to a position like this, you're going to get a gaming-led platform." Whatever message the company sent you last year, the message they're sending today with Spencer's ascent is that, gamers, Microsoft wants you. In fact, Microsoft doesn't just want gamers flocking to the Xbox One, but today's moves in the company to tighten the Xbox team also appear to be putting Spencer and the Xbox team in a position to ensure gaming is important on all of Microsoft's platforms. The company's gaming focus would be "leading with Xbox One," he said, "but also thinking about Windows and our other platforms and making sure that gaming shows up as a real catalyst for those platforms' growth as well. But Xbox One is our most important gaming asset to date. [We want to] make sure we're completely focused on that gaming customer, that core gaming fan. Making sure of that, that's what I'm going to bring to this position is a focus on gaming for Xbox One. The entertainment features that we have on Xbox One are important, but those can't come at a cost for what we do for the core gamer." Spencer didn't have many teases today for what Microsoft has on tap for gamers, though he did say this about the Xbox One's expected showing for the year's big gaming show this June: "I'm looking at the E3 line-up and it's incredibly strong both with sequels and new IP, unannounced things.'" What Spencer did talk a lot about is the more subtle and potentially more meaningful ways that today's streamlining of the Xbox organization, putting one man in charge of games and platforms for the first time in a while, might help the Xbox One improve. In the structure that Microsoft had for Xbox One last year, Spencer ran game studios and Marc Whitten, who left the company last month, ran the Xbox platform. The teams didn't cross over much, it seems. Spencer explained how that worked and in what ways that structure could be problematic. "Maybe we had a team here on the studio side that had an idea—either coming from one of the internal teams or one of our partnerships—and was something we wanted to make possible on the platform," Spencer said. "That would kind of bubble up in the studio organization, eventually getting to me. Then, on a weekly basis, Marc and I would sit down and have conversations about the integration of the Xbox platform and service component with the studio component and we would jointly decide on the roadmap of the Xbox platform. "And then Marc's team was the team responsible for going off and driving the implementation and then that feedback loop, as the feature started to get built into alpha and beta for the platform, would get shared back into studios. My goal is to cross-pollinate the organizations a little bit more, streamline the decision-making so that those conversations happen at more than just the top level but all the way down through the organization." That's all quite abstract, but if that would, say, lead to a better Achievements system or better game-invite system, or things of that nature, then that's good news. 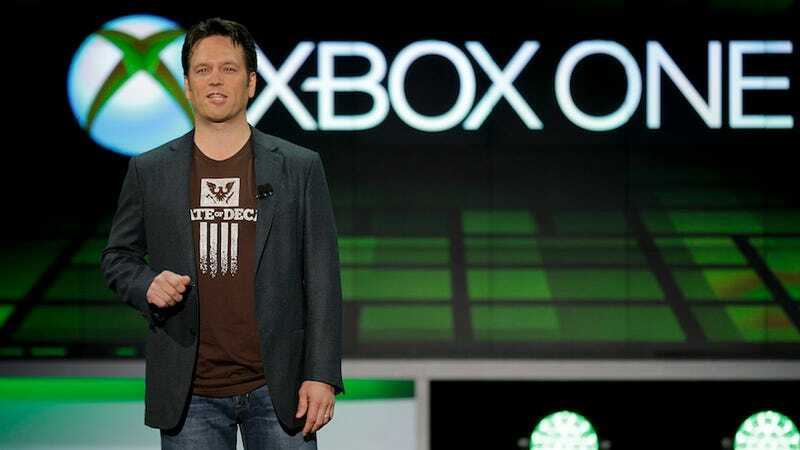 Spencer will be reporting in as head of Xbox to Terry Myerson, who oversees operating system development at Microsoft. Spencer: "The entertainment features that we have on Xbox One are important, but those can't come at a cost for what we do for the core gamer." In announcing Spencer's promotion today, Nadella wrote that "combining all our software, gaming and content assets across the Xbox team under a single leader and aligning with the OSG team will help ensure we continue to do great work across the Xbox business, and bring more of the magic of Xbox to all form factors, including tablets, PCs and phones." Nadella's phrasing raised the question about whether "Xbox" will be Microsoft's brand for all things PC gaming, too. "I don't want to be explicit on any kind of brand decision at this point," Spencer said, when I asked him about it. "I'd say that the organizational change and head of Xbox and what that brand shows up on on PC, we'll make that decision at some point. But I've said publicly a few times that our focus on PC gaming is strong right now... Frankly, a key to me moving into Terry Myerson's team, who runs the platform software team for the whole company, is to make sure we have gaming in his leadership team, so when we're focused on Windows—the future of Windows, what we're doing with Windows Phone—that we think about the success that we've built with Xbox in gaming and make sure we learn from that. "The PC, obviously, is a top priority for us as a company. Gaming on PC is incredibly strong, but we as a platform company can do a better job in that ecosystem and those are conversations Terry and I are having almost daily about that focus." As big a boost as Spencer got today, he said he'll still stay in direct touch with gamers. He Tweets, and you can Tweet him. He's @XboxP3. "For me that avenue is a way for me to get smarter either as the head of studios previously or the head of Xbox, and I'll stay active there, because I think it's a critical part of driving any 21st century business." To contact the author of this post, write to stephentotilo@kotaku.com or find him on Twitter @stephentotilo. Phil Spencer photo: Jae C. Hong, Associated Press.